Queen Anne’s lace earned its common name from a legend that tells of Queen Anne of England (1665-1714) pricking her finger and a drop of blood landed on white lace she was sewing. 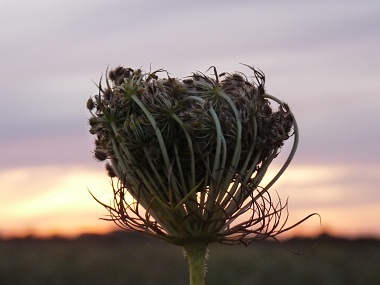 Belonging to the carrot family, Queen Anne’s lace is a biennial that is also known as wild carrot. Early Europeans cultivated Queen Anne’s lace, and the Romans ate it as a vegetable. American colonists boiled the taproots, sometimes in wine as a treat. Interestingly, Queen Anne’s lace is high in sugar (second only to the beet among root vegetables) and sometimes it was used among the Irish, Hindus and Jews to sweeten puddings and other foods. Distinguishing Features: The Queen Anne's lace flower resembles lace, and oftentimes the flower has a solitary purple dot in the centre. In addition the root smells like carrots! Flowers: Queen Anne’s lace flowers have a flat-topped white umbel, sometimes with a solitary purple flower in the center. These flowers bloom from late spring until mid-fall. Each flower cluster is made up of numerous tiny white flowers. The flower cluster start out curled up and opens to allow pollination. The cluster then rolls itself shut again, like a reverse umbrella when it goes to seed at the end of the season. Fields of Nutrition has medicinal benefits and vitamin/mineral content of Queen Anne's Lace. 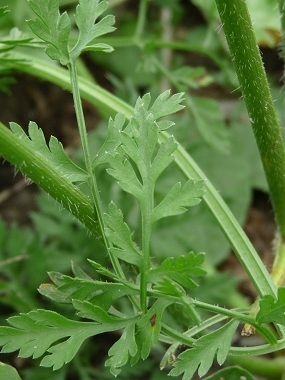 Leaves: Feathery leaves resemble those of the domestic carrot. The bases of leafstalks are broad and flat. Queen Anne’s lace leaves also closely resemble the leaves of the poison hemlock, fool’s parsley and water hemlocks, all poisonous cousins of Queen Anne’s lace. 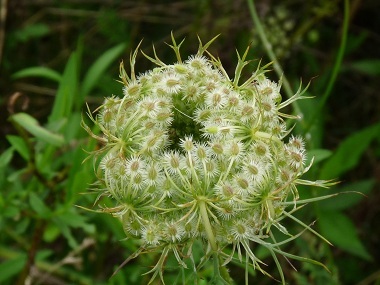 Height: Wild carrot can grow tall, most average about 1 metre tall. 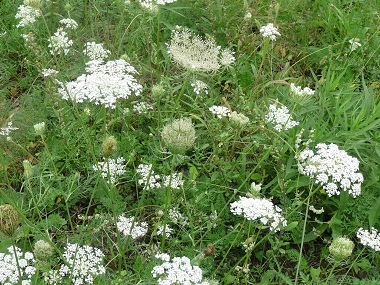 Habitat: Queen Anne’s lace is found in fields, meadows, waste areas, roadsides and disturbed habitats. They are very hardy and thrive in a dry environment. Edible parts: Using first year Queen Anne’s lace plants are recommended. Roots are long, pale, woody, and are finger-thin and are used in soups, stews and in making tea. First year leaves can be chopped and tossed into a salad. Flower clusters can be ‘french-fried’ or fresh flowers can be tossed into a salad. The aromatic seed is used as a flavoring in stews and soups. Similar Plants: Poison Hemlock, Fool's Parsley . For more in-depth information (e.g. nutrition, medicinal values, recipes, historical information, harvesting tips, etc.) 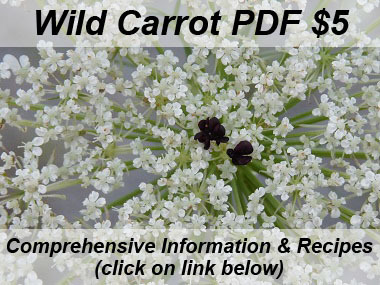 please check out our Queen Anne's Lace PDF magazine.